This is a success story sent through by PAG KIDO from Aguyaguya, one of the villages where they are working and where they have been developing VSLA groups. In 2015 Samuel started rearing bees after noticing the high demand for honey. “I started with ten beehives and God blessed them and they were colonised within 2 weeks. I was very happy because I knew that my life would change in a few months. In my first harvest, I harvested 25kg of honey from 5 beehives. I did not eat it all but decided to take 20kg to the market where it fetched me UGX 180,000. I sold it at UGX 9,000 per kg. 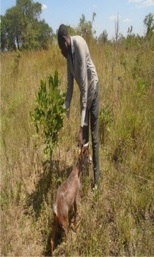 After getting the money I bought two goats at UGX 140,000. These goats have multiplied to 12 goats which I used in the marriage of my wife. As a determined man I could not stop with 10 hives and went ahead to look for more hives because my dream was to have a big number of beehives. I now have 100 hives which have already colonised.” Samuel’s family has a target of increasing the hives to 150 by mid-June 2019. “At harvest time they will give me a minimum of 10 kilograms of unprocessed honey per bee hive and a kilogram is sold at 9,000 UGX (USD 2.5). 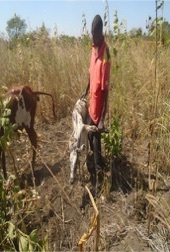 So far I have harvested from 20 bee hives giving me 53 kilograms which earned me UGX 424,000 (USD117.8).” Samuel has now also bought cow at UGX 325,000. “We are excited and very thankful for how God just opened a door for the future for my family”. Samuel commented.